Located on the main road of SR Nagar, Harsha Deluxe Mess is a 25-year-old mess that whips delicious, spicy, and authentic Andhra meals, biryani, and meat delicacies. Hold your horses when you walk into Harsha Deluxe Mess. It’s crowded. It’s boisterous. And it’s stuffy. Make up your mind to eat a meal by sharing your table with a bunch of strangers who barely look up even for an interesting piece of conversation. Such is the food at the mess! The seating is modest with steel chairs and tables. You pay at the counter, get inside the mess, and occupy whichever table is vacant. While awaiting your meal, take pleasure in the sight and aroma wafting through the kitchen. My friend, this is a meal you’ll remember for quite a long time. The service is super swift and you will find your plate meals on the table within seconds. On the table, you’ll find a chutney for the day, pickles, podi, a pot of ghee etc. The meal comes with a curry of the day (this one’s usually crunchy and deep-fried), dal, rasam, sambar, a gravy curry, papad, curd etc. Buckets full of dal, sambar, rasam, and curries are placed on your table which means you can eat all you can. If you’re interested in devouring meat, try the prawns' fry (INR 200) or chicken curry (INR 90) or choose from the meat offerings of the day. You can also ask for a side of an omelette (INR 20) or a boiled egg (INR 10). On the menu, you will also find chicken fry biryani (INR 120-160), veg biryani (INR 60), and several other variants of biryani. The mess also has tomato rice (INR 50), lemon rice (INR 50), and curd rice (INR 40) and they are also priced on budget. Cannot handle the crowd? Order the food on Swiggy or go for a takeaway. Either way, your tum will thank you for the treat. 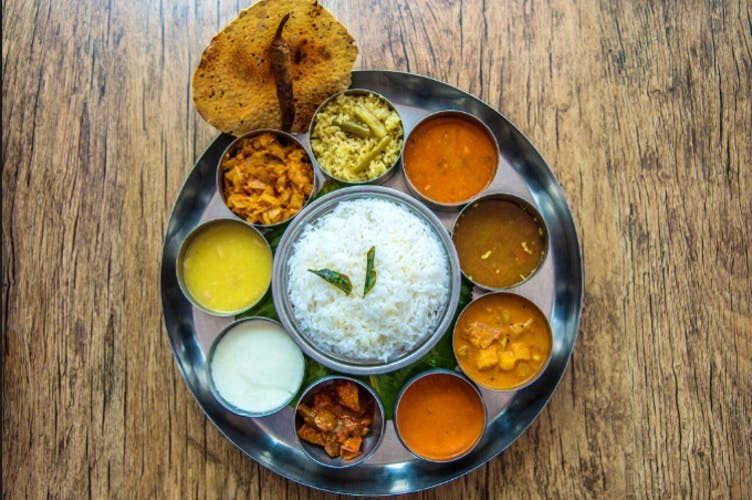 Here, you are in the good company of authentic (Guntur-style cooking) food and it can be really spicy for someone who doesn't like really tangy food. So, you might want to have a bottle of water around if spicy food isn’t your cup of tea. The mess is usually less crowded between 12pm-1pm, so the best time for you to visit would be then.